How I Gained It: I ate a lot of junk food for "quick energy," and I was a vegetarian who didn't eat fruits or vegetables. Stuck in an unhappy marriage with two small children, I ate to make myself feel better. Sugar, fat and carbs made me happy and gave me a special moment. I would sit up at night, after my family had gone to bed, and eat to fill the void inside. It was a little bit of "me time" in a busy day, though it was self-destructive. I didn't exercise at all. When I wasn't taking care of my children or cleaning the house, I sat at my desk, working. Even though I had been a fitness instructor in my early 20s, movement was something I avoided. I reached my heaviest weight over the summer of 2003. My father got aggressive lung cancer, and between taking care of him, my stepmother, my two children, the household and working, my weight ballooned up to 198 pounds. Breaking Point: Most of the time I avoided thinking about my weight. That overweight woman in the window reflection, that wasn't me. It was someone else (wasn't it?). But there were times I was reminded that that woman was indeed me, like the time I was too "fluffy" to fit into a ride at Legoland. The bar on the ride would not close down over my stomach. The "moment of truth" happened in August 2003 when my father passed away. I sat there holding his hand, watching him take his last breaths. In those frightening final moments of his life, I realized that I was mortal and that some day I would die, too. I had spent my life wasting away time, waiting for the day when I would miraculously wake up thinner and fitter, full of happiness and life. But that day never came, and I had not done any of what I wanted to do with my life. That's when I decided to try one more time to become healthier. Try, or die. 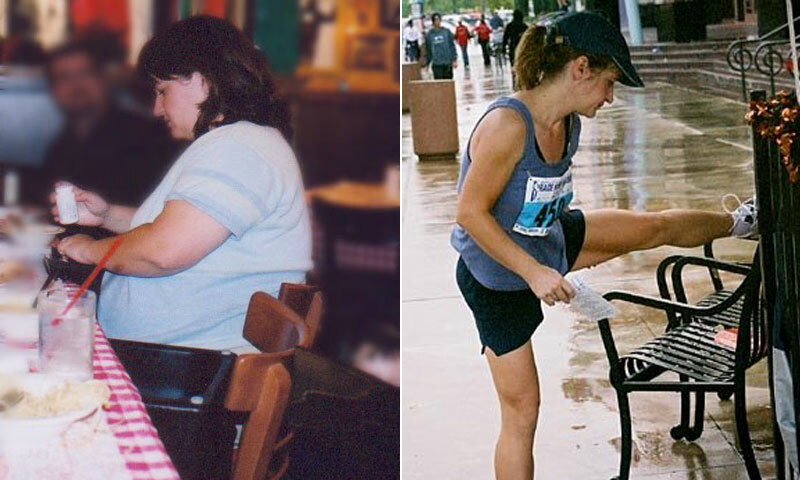 How I Lost It: I didn't set any weight loss goals because I was afraid I would fail again. I didn't tell anyone, nor did I adhere to any strict diet. I just went day by day, focusing only on becoming healthier. I ditched the standard rules of weight loss and told myself there were no "bad" foods, no off-limit foods, so I wouldn't pull the old "I blew it and will start again tomorrow" trick. Little by little I started to shed weight, and I began to believe that this time I might actually make it. I added more vegetables to my diet. I increased my protein intake with cottage cheese and Greek yogurt. I slowly cut back on the refined carbohydrates that had been my diet staple, adding fruits instead when I needed a sugar "pick-me-up." I ate three main meals a day and three snacks. The main meals were mostly protein and fruit or protein and veggie, with protein and fruit for snacks. I cut my calories down slowly so I would not get too hungry, because hunger can be a recipe for disaster when trying to lose weight. I started walking the kids to school three days a week. After a few weeks of walking, I began strength training early in the morning in my living room with a workout DVD. I alternated upper body and lower body/abs on different days, rotating throughout the week, six mornings a week for about 15 to 20 minutes each day. After about three months of consistently walking and doing strength workouts, I took my first Spinning class and became hooked. After that I started attending Spinning classes regularly two to three times a week, and the weight literally fell off. My life has changed 180 degrees from what it was. I still put my kids first, but I also prioritize taking care of my health now, too. I am so much stronger both mentally and physically than before, and have done so many things I never thought I would or could. It's still very hard at times (I drive a 13-year-old van and wear seven-year-old clothes), but the lightness in my heart as I wake up every day is worth the struggle. I have ridden a Century ride (100 miles) on my bicycle, ridden up the side of a mountain four times and run a 5K. I have become fearless, interviewing rock stars and even writing for national magazines and newspapers on health and fitness. Most importantly, I am now able to give back. I became a personal trainer and Spinning instructor after my successful weight loss, and last year realized my lifelong dream of becoming an author. My book is a real-life guide to weight loss that draws from my own experiences, and shows people that they can, indeed, "have their cake and lose weight, too." I know their struggles and their pain, and I also know it's possible to overcome them. I want to share hope and inspiration. Recently I followed another dream and founded a non-profit aimed at helping women gain skills to re-enter the workforce. After my weight loss I got divorced and learned first-hand how challenging it can be financially for single mothers, especially ones who have spent time raising children rather than upgrading their skills. Helping others is what life is all about. After Weight: Ten months after I started losing weight I was 116 pounds. I am now around 125 pounds. I have kept the weight off for nine years.